A flowering Chilli Mandragora with blossoms native to Phindym. 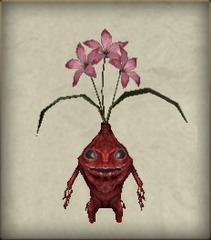 The Mandragora is a hermaphrodite and is able to reproduce by itself. However, this Chilli Mandragora cannot produce fruit even though it can produce flowers. This is a side effect of generations of artificial breeding.